Coming off an era which saw several JUDAS PRIEST albums that have gone down as some of the greatest in the entire history of heavy metal (namely, 1980's British Steel and 1982's Screaming for Vengeance), the band from Birmingham knew that their next release had to 'deliver the goods,' to cement their standing as the leaders of metal. And deliver they did, with their platinum-certified 1984 release, Defenders Of The Faith, which spawned such headbanging classics as "Freewheel Burning", "Jawbreaker", "The Sentinel", "Some Heads Are Gonna Roll" and "Love Bites". 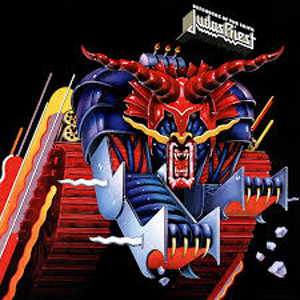 And on March 10, 2015, a newly expanded three-CD version of the album will be unleashed via Columbia/Legacy, which includes the original ten-track album remastered by producer Tom Allom, and a complete live recording from the Defenders tour, recorded at the Long Beach Arena in California, on May 5, 1984. The 21-track concert (split up over two discs) perfectly balances the then-new material from the group's ninth studio offering overall, including such classics as "Metal Gods", "Breaking the Law", "Sinner", "Electric Eye", "The Green Manalishi (With the Two-Pronged Crown)", "Victim of Changes" and "You’ve Got Another Thing Coming", among many others. As the band states in the liner notes to the reissue, "It's 30 years since we released Defenders Of The Faith - we're very proud to say it has become a classic that's beloved by PRIEST fans throughout the world"
JUDAS PRIEST continues to 'defend the faith' to this day, as the group recently issued their seventeenth studio album, Redeemer of Souls, which sees the band's popularity amongst metalheads remain as strong as ever, as it debuted higher than any other previous PRIEST release (at #6 on the Billboard 200). And on the group's current tour, quite a few classics from Defenders are being performed for the first time in years.